Announcement Welcome to Forest Candle Studio! 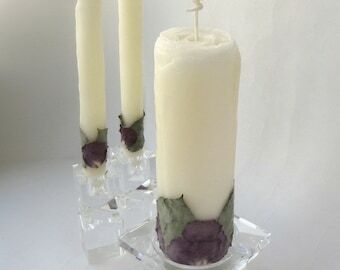 I'm passionate about creating unique beeswax candles unlike any you have ever seen. 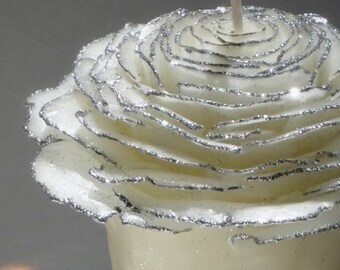 Each candle is a work of art, individually handcrafted. They are meant to add beauty and natural luxury to your life - light them, display them, keep them for yourself, give them away, whatever brings you joy! A favorite for gifts for all occasions, home decor, holidays, weddings and other special events. Need it right away or close to it? ...see my "Almost or Ready To Ship" section for candles that ship in 1-7 days. All other candles are made-to-order. See each listing's "Shipping & Policies" tab for that item's estimated ship date. Contact me if you need the candles by a specific date sooner than what's listed. Rush orders accommodated when possible but may incur an additional fee. Producing work of the highest quality and providing excellent customer service are my top priorities. Click "favorite shop" button (located at top of my shop pages) to get my new listings shown in your homepage activity feed. Click the blue "follow" button located on the left side of the page to get my latest Etsy favorites shown in your homepage activity feed. Thank you for shopping at Forest Candle Studio! Welcome to Forest Candle Studio! It all started in late Spring 1996 when I fell in love with working with beeswax and roses in my encaustic paintings. 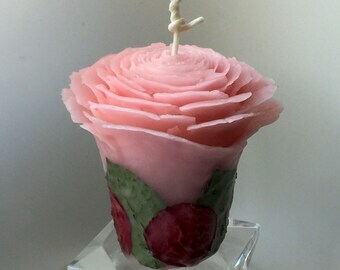 The sculptor side of me envisioned a candle shaped like a rose, mounted on rock, adorned with whole roses. I had to see what it would look like! I'd always loved candles but had never made them before, so I jumped right in and spent the summer turning my idea into reality. First I studied traditional candlemaking techniques, then developed my own. 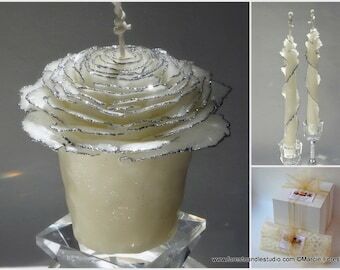 By September my first group of "Rose Candle Sculptures" were completed and quickly sold out. Forest Candle Studio was born! 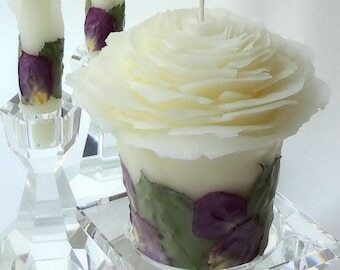 Over the years my original candle designs continue to evolve and new designs are added. As always, I use my own special techniques to handcraft each candle as an individual work of art. No two candles are exactly the same. Whether lit or displayed, they are meant to add beauty, joy and natural luxury to your life. Many of the candles can be reused indefinitely by replacing the burned core with a votive or tea light. I use 100% pure beeswax from honey farms in California and the Pacific Northwest. 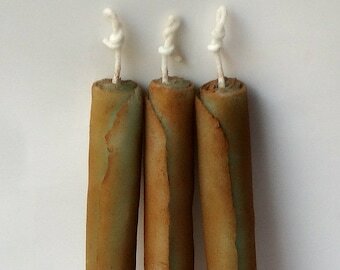 The natural colors of my beeswax candles range from golden amber to ivory white. To create unique shades in a wide variety of colors, I hand-dye the beeswax in small batches using eco-friendly USA-made candle dyes. With loving care and close attention to detail (and my favorite knife & paint brush! 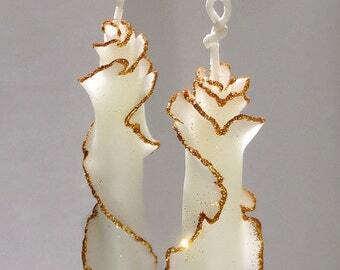 ), I hand-build, shape and dip many delicate layers of beeswax until satisfied with each candle design. To adorn the candles, I use fair-trade roses that I air dry in small bunches throughout the year. A final dip in beeswax preserves their natural beauty. Other adornments include organic spices, organic lavender, paints & glitters, ribbons, brooches and other beautiful or unusual materials. 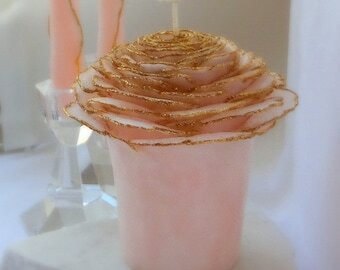 For the Rose Candle Sculptures, I hand-cut granite and other types of natural stone to use as permanent bases. The entire process for each candle can take several days to a week or more. A variety of candle sizes, styles, colors, adornments, and quantities are available in my shop or by request. 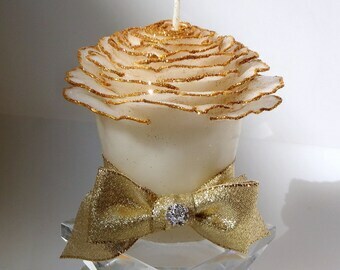 Any of my candles can be customized to your needs - just ask! Don't forget to bookmark my page or add my shop to your Etsy Favorites so you can find me again easily! • COMING SOON: Hopefully by Spring 2018 I can restock my other Etsy shop with my original art, fashion & other fun things; please stop by when you get a chance! • Featured on HGTV on The Carol Duvall Show "Artist-at-Work" series. • Rose Garden Tapers in their home on "The Osbournes" TV series. Owner, Maker/Designer, Curator/Everything Else That Needs Doing! Hello and welcome to Forest Candle Studio! 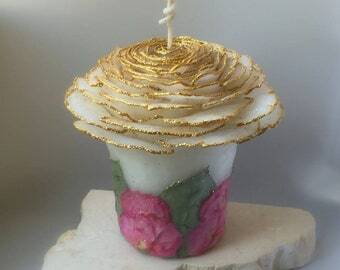 My name is Marcie Forest - I'm a beeswax candle artisan and fine artist. Unique work, superb craftsmanship, and excellent customer service are my top priorities.